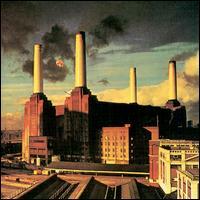 Animals is my absolute favorite Pink Floyd album. No one knows about it. Everyone is like, "The Wall this...and Dark Side that..." While those are great and timeless albums, I still enjoy the challenge I get from Animals, plus the allusions to Animal Farm. There are three monstrous songs sandwiched between a short intro and outro track. These two short tracks don't even fit with the subject matter of the middle songs. They're love songs. The album doesn't even fit in with the dominant format of the time of its release, the vinyl LP. Generally, vinyl LP's had a capacity of 45 minutes, split up between both sides. Apparently you can squeeze as much as 26 minutes per side, but the more you squeezed on the disc, the lower the fidelity. Animals clocks in at 41:41, but side two is longer than side one by nearly five minutes and it runs over the 22 1/2 minute per side convention. The 8-track tape goes as far as to chop "Dogs" up into two pieces to conserve tape. The song is about people in power, three different ones. The first being a non-descript businessman who uses the "sheep" to make his wealth. The second is apparently Margaret Thatcher--an up-and-coming Conservative politician and Leader of the Opposition in Parliament when the song was written--just before she was Prime Minister. And the third is Mary Whitehouse, a conservative crusader who called for censorship of media in the UK in the 70s. Roger Waters actually calls her out by name in the song, unlike the previous two pigs, which only have been speculated upon. The cowbell shows up during the choruses and bridges after the verses. It's really prominent and easy to pick out in the mix. A fine example of using the cowbell in place of the ride.